A while back I had asked for some guest posts and my lovely friend Linda from the blog Ciao Chow Linda has been gracious enough to bestow one upon me. I have been reading Linda's blog for years now and she never fails to delight with her travels and with her recipes. I hope you enjoy this post as much as I do. One of my favorite fish is halibut. It's got a delicate, sweet flavor, firm white flesh, and marries well with all kinds of flavors. Even people who claim to hate fish may be won over once they taste this largest of all the flat fish. Did you know that halibut can grow to more than 8 feet long and weigh as much as 700 pounds? 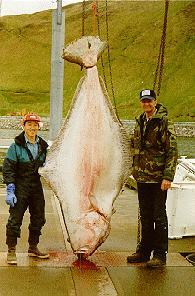 Take a look at the largest Alaskan halibut ever caught by sport fishermen, weighing in at 459 pounds. Imagine cleaning that whopper. Most of the halibut we eat here in North America comes from the Gulf of Alaska. While on a trip there a couple of years ago, I ate my fair share of halibut, but here in New Jersey, the price keeps me from enjoying it as much as I'd like. So when it went on sale last week at my market, I couldn't resist. This recipe is a one-dish meal that's simple to make, tastes great and is low-cal too. If you can't find fresh halibut, or want something less expensive, codfish can easily be substituted. The recipe is for two portions, although the accompanying photo shows just one portion served in a small casserole.